COOK - Isles des Cocos appellée Bosscaiven par le Capitaine Wallis / Isles des Traîtres appellée Keppel par le Capitaine Wallis. Tome II Pl. 4. COOK, Captain James. - Isles des Cocos appellée Bosscaiven par le Capitaine Wallis / Isles des Traîtres appellée Keppel par le Capitaine Wallis. Tome II Pl. 4. Isles des Cocos appellée Bosscaiven par le Capitaine Wallis / Isles des Traîtres appellée Keppel par le Capitaine Wallis. Tome II Pl. 4. - COOK, Captain James. Title : Isles des Cocos appellée Bosscaiven par le Capitaine Wallis / Isles des Traîtres appellée Keppel par le Capitaine Wallis. Tome II Pl. 4.. Size : 7.6 x 7.5 inches. / 19.2 x 19.0 cm. 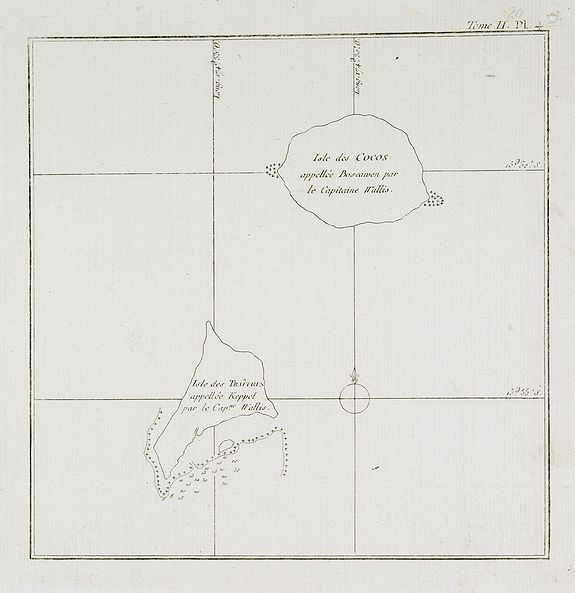 Description :Chart of the Cocos and Keeppel Islands. Territory of Cocos (Keeling) Islands, also called Cocos Islands and Keeling Islands, is a territory of Australia. This map is taken from the first French edition of James Cook's first voyage entitled Relation des voyages entrepris par ordre de sa Majesté Britannique actuellement régnante pour faire des découvertes dans l'hémisphère méridional, et successivement exécutés par le commodore Byron, le capitaine Carteret, le capitaine Wallis et le capitaine Cook dans les vaisseaux "le Dauphin ", "le Swallow" and "l'Endeavour". An Account of the voyages undertaken by the order of His Present Majesty for making discoveries in the southern hemisphere, and successively performed by Commodore Byron, Captain Wallis, Captain Carteret and Captain Cook, in the Dolphin, the Swallow, and the Endeavour , the first official three-volume account of James Cook's first voyage, was edited by John Hawkesworth in English in London in 1773. The first volume contains accounts of the voyages of Byron, Wallis, and Carteret. The second and third volumes are entirely concerned with Cook's voyage, based upon material drawn from journals kept by Cook and the papers of Joseph Banks. Hawkesworth composed his account in the first person of Cook and incorporated Banks's descriptions and observations as well as his own commentary, without ever distinguishing the different sources. In addition to the written account of the voyage, the two volumes related to Cook's voyage include 31 illustrations, charts, and maps. Condition : With one vertical fold as issued. Repair of marginal hole in upper right margin. Else good condition.